I use a 27” 2560 x 1440 display for programming. To make the most of all these pixels it’s important to be able to quickly arrange your windows to fill the screen. There are many impressive tiling window managers for Linux but I like to retain the flexibility of manually stacking and resizing windows. Back when I used Windows, WinSplit revolution was a handy keyboard driven way to emulate basic window tiling without committing to a full-on tiling window manager. QuickTile works in a similar way and is easily customisable since it is open source and written in Python. I have most of the keys bound to actions on the num-pad with a Ctrl + Alt modifier. 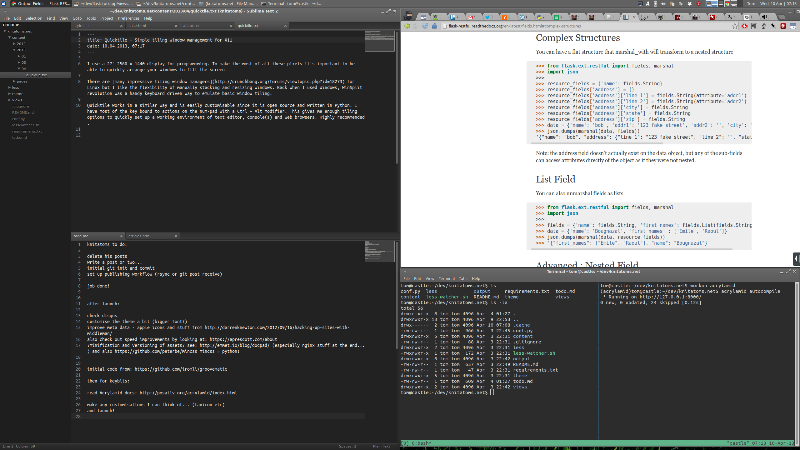 This gives me enough tiling options to quickly set up a working environment of text editor, console(s) and web browser. QuickTile has worked reliably for me in KDE and now XFCE on Xubuntu 12.10.